Put broccoli and carrots in separate pots with water and steam until soft. Chop and sauté or caramelize onion if using onion. 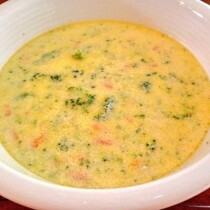 In a large soup pot, melt butter then add heavy cream, half and half and chicken broth. Bring to a simmer. Add salt, pepper and nutmeg. After veggies are soft, strain any water and chop veggies. Add chopped veggies to the broth mixture. Bring to a simmer/boil. Lower heat and add cheese, stirring until melted. Turn off heat, taste and adjust salt if need be. Note, never bring soup back to a boil after adding cheese, this will cause the soup to curdle. Makes about 5-6 cups of soup.